The Republic of Liberia, located on the west coast of Africa, has provided corporate registry services internationally since 1948. As one of the oldest corporate jurisdictions, the Liberian Registry has global presence in the offshore service industry. LISCR, the Liberian International Ship and Corporate Registry, administers the Liberian Corporate Registry, pursuant to an act of law of the Liberian legislature. The Registry provides, through The LISCR Trust Company, an exclusive registered agent service for all non-resident Liberian entities. With an established legal system, dedicated to innovation and continuous commitment to quality service, the Liberian Corporate Registry has earned world-wide recognition by key industry professionals. The Liberian Associations Law, generally modeled on the corporate law of the U.S. State of Delaware, allows for the formation of Corporations, Limited Liability Companies, Private Foundations and Limited Partnerships. Liberian entities are simple to form and administer, cost efficient and highly confidential. 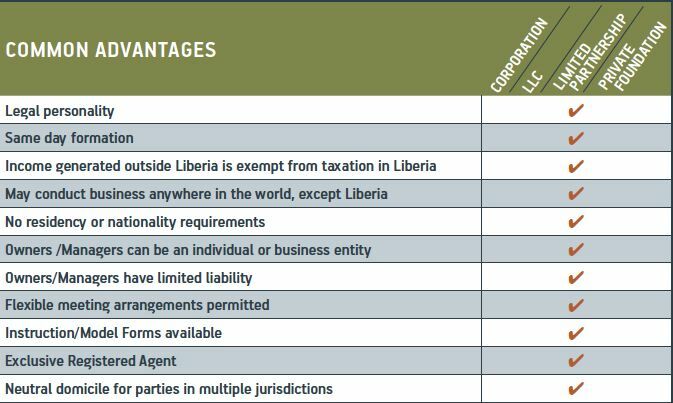 Despite the rapidly changing regulatory environment of the offshore corporate sector,Liberia is committed to providing flexibility, confidentiality and security.